Cake | I Wanna Bake! We interrupt our regularly scheduled programming to bring you another Great British Baking Show classic: Mary Berry’s signature lemon drizzle cake! I wanted to try something that was quintessentially British (and thus quintessentially Mary Berry), and I can’t think of anything that fits that bill better than this particular dessert. We’ve made it to Phase Two! Following my previous mirror glaze post, it’s time to reveal the cake it covered. This week, we’re talking about Iron Man 3. To find out how that relates to mandarin orange chocolate cake (which I can assure you tastes even better than it looks), read on! The Marvel Cinematic Universe (MCU) baking series is trucking right along, even in the face of a minor setback. This week’s post was originally supposed to be based on Iron Man 2, but I’ve decided to delay that recipe due to the seasonal availability of the fruit I plan to use. To make up for it, I’ve jumped ahead to my one of my favorite superheroes: Thor! Hello, readers! It’s been some time, hasn’t it? Sorry to drop off the face of the Earth with no warning, but I’ve really needed some time to recharge lately (this is an ongoing thing, so posts may be sporadic for the near future). However, I didn’t want to leave you hanging for Mother’s Day, so I humbly present this lemon juniper bundt cake for your consideration. For the next installment of Comfort Food February, we’re switching gears to dessert. One of my husband’s (and my own) favorite things about winter is a warm mug of hot chocolate topped with mini marshmallows and served with a rolled wafer cookie. How do you preserve the warming comfort of a mug of hot chocolate outside of the (maybe) half hour it takes to get cold? Turn it into a cupcake! By now, you may have noticed that I’m a bit of a fan of the Great British Bake Off (and all the American spin-offs it has spawned). It seems my family has caught on too, because several of my birthday presents this year were GBBO-themed (thanks, guys!). In light of all this new baking loot, as well as a serendipitous appearance of dried Medjool dates on a recent trip to Aldi, it only made sense to bake something from one of my new cookbooks. This date and walnut “traybake” comes from Mary Berry’s 100 Cakes and Bakes. Caramel apples may start disappearing from grocery stores soon, but that doesn’t mean that you have to go without until next fall. Today, I bring you the caramel apple in cupcake form! Soft apple cake meets homemade caramel frosting, and together they’ll make you forget about caramel apples entirely. Today is an auspicious day in I Wanna Bake’s history: its 100th post! Thank you for sticking with me this long and listening to my rambling week after week. I wanted to do something special for my 100th post, and after months of racking my brain, I settled on something that is delicious, pretty, and seasonally appropriate: apple honey cheesecake. 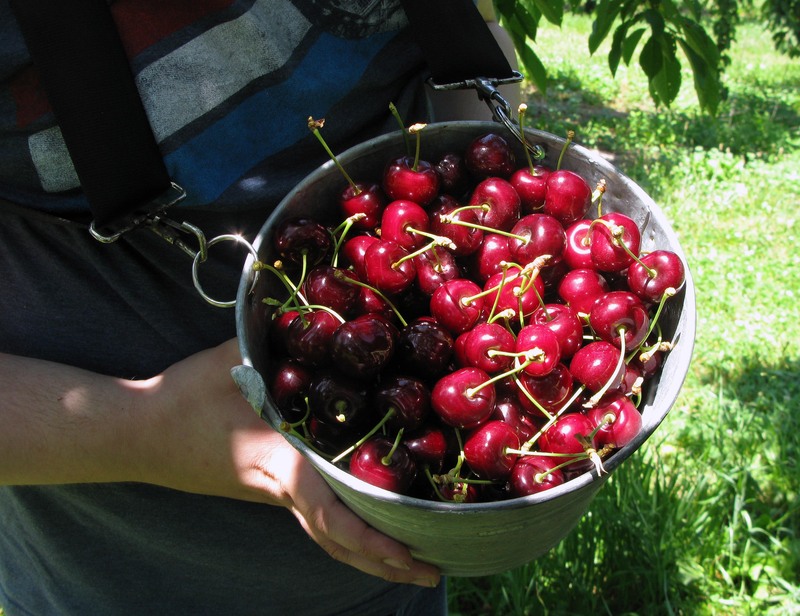 We’re currently at the tail end of one of my favorite seasons of the year: cherry season! Josh and I celebrated by picking 6 pounds of them while we were in Traverse City, Michigan last week (6 pounds was me exercising restraint). I would have loved to take them ALL home, but I know there’s no way I can use them fast enough. Sigh. Apologies for my tardiness! I just got back from a Midwestern road trip through Illinois and Michigan. Yes, I probably should have written a post in advance so I wasn’t scrambling at the last minute, but I think by now you probably know how I roll.